What Was The First Medical X-Ray Of? Which Alien Makes A Subtle Cross-Movie Cameo Appearance In Star Wars: The Phantom Menance? 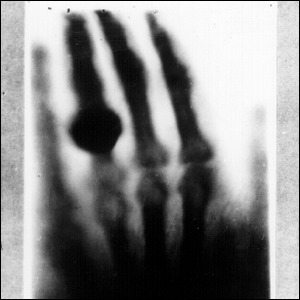 X-rays were discovered in 1895 when German physicist Wilhelm Röntgen stumbled upon them during his experiments with Lenard and Crookes tubes (early experimental electrical discharge devices). Specifically, he discovered that a form of invisible rays were passing through one of his experimental enclosures and causing a fluorescent effect on a screen painted with barium platinocyanide near his experiment. The medical application of his discovery was readily apparent to him, and Röntgen immediately set to work publishing and promoting his findings. It’s estimated that in 1896 alone, as many as 49 essays and 1,044 articles were published on the topic of X-rays and their potential to revolutionize medicine. The first use of X-rays for medical diagnosis also occurred that year when English doctor John Hall-Edwards used them to locate a needle stuck in the hand of one of his associates and, later that year, for surgical purposes.